Implicant is a product/minterm term in Sum of Products (SOP) or sum/maxterm term in Product of Sums (POS) of a Boolean function. 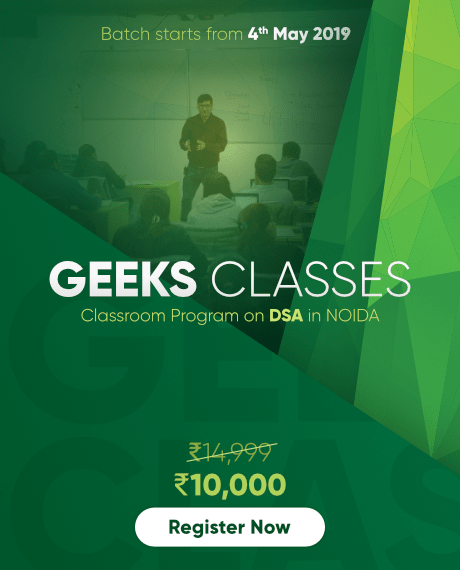 E.g., consider a boolean function, F = AB + ABC + BC. Implicants are AB, ABC and BC. 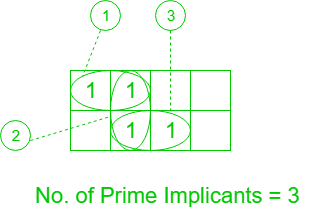 A group of square or rectangle made up of bunch of adjacent minterms which is allowed by definition of K-Map are called prime implicants(PI) i.e. all possible groups formed in K-Map. These are those subcubes(groups) which cover atleast one minterm that can’t be covered by any other prime implicant. 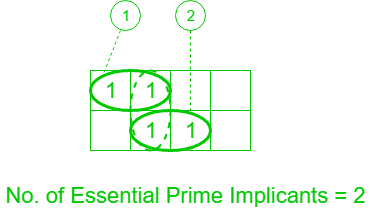 Essential prime implicants(EPI) are those prime implicants which always appear in final solution. 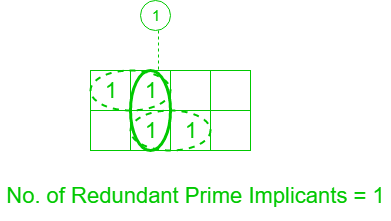 The prime implicants for which each of its minterm is covered by some essential prime implicant are redundant prime implicants(RPI). This prime implicant never appears in final solution. 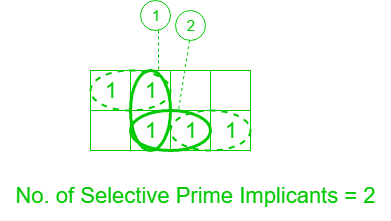 The prime implicants for which are neither essential nor redundant prime implicants are called selective prime implicants(SPI). These are also known as non-essential prime implicants. They may appear in some solution or may not appear in some solution. 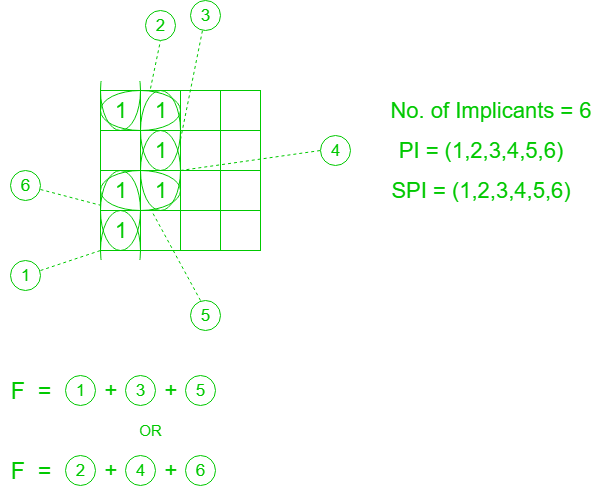 Example-1: Given F = ∑(1, 5, 6, 7, 11, 12, 13, 15), find number of implicant, PI, EPI, RPI and SPI. 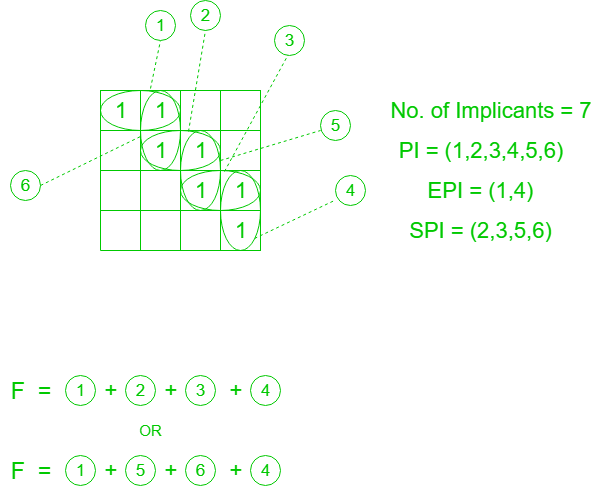 Example-2: Given F = ∑(0, 1, 5, 8, 12, 13), find number of implicant, PI, EPI, RPI and SPI. 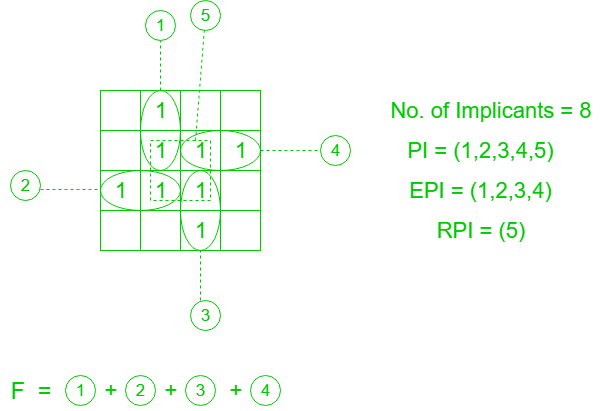 Example-3: Given F = ∑(0, 1, 5, 7, 15, 14, 10), find number of implicant, PI, EPI, RPI and SPI.